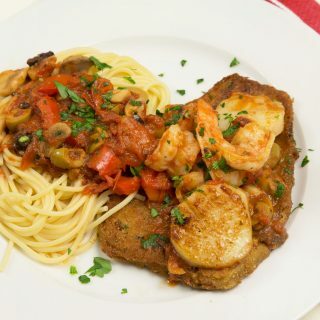 Making delicious restaurant style meals at home is really easier than you think, and dishes like a seafood combination are not only perfect for that intimate dinner for two, but also for a party of eight, It’s all in the timing! I don’t know when clams casino lost their popularity, and it’s a rare occasion to find them on a menu. For those of you that have never had them, you really need to make them. The next time you friends or family over make two dozen and watch them disappear, I promise you they will be the hit of the evening! If you’re pressed for time, you can make the clams up ahead of time, they store well and can even be frozen. I’ll let you in on a little secret to opening clams easily too! If your stuffing clams, throw them in the freezer for about an hour, rinse them under cool water and just slip a knife in and they open like magic! Now this only works for stuffing clams, please don’t use this method for clams on the half shell! While we’re talking about clams, I want to mention that you need to be sure your source is reliable, small bags of clams will always have a tag on them, telling you when and where they came from, it’s the law! This is true for mussels too. If your buying clams or mussels by the dozen and they’re on display, you can ask to see the tag that came off the original container. Only buy shellfish from reliable sources you trust! My seafood combo was very basic with 3 shrimp, 4 scallops, a small piece of flounder with some jumbo lump crabmeat, a half a dozen mussels, and of course my clams casino. 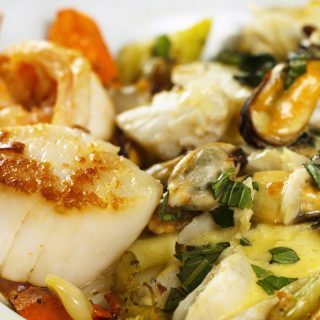 I placed all my seafood (except the crabmeat and clams casino) in a baking dish with a little water in the dish, and spooned a little melted butter over the seafood and a sprinkle of old bay, place in a 350-degree oven for about 20 minutes. I kept the casino in a separate dish because they needed a few minutes under the broiler, after their time in the oven. The crab meat I gently sauteed in melted butter and topped the flounder with the crab meat when I was ready to serve dinner. Make your favorites sides, a small salad, and you’ve just saved yourself about 65% of what the meal would have cost you if you had gone out to dinner. Slice the bacon slices about 1/8 of an inch thick. place the butter, bacon, peppers, and onions into a medium sauce pan and cook on low heat for about 15-20 minutes. Remove the pan from the heat and add the grated Romano, black pepper, Oregano (and always use dry, fresh oregano does not work as well) and the chopped parsley. Mix well. Take the clams out of the freezer, and rinse them in a bowl with running water for about 5 minutes. Open your clams with the blade of a knife, just be careful! Take a spoonful of the prepared Casino mix and make a nice mound of it on top of the clam, pressing it into the clam firmly with your hand. Repeat this process until all of the clams are stuffed. Now place your clams in a casserole, there will be butter run off, so we don’t want that spilling into your oven. Place the clams into a 375 degree oven for about 15 minutes, then finish for about 5 minutes under your broiler or until the bacon and tops begin to get nicely browned. *Casino mix can stay refrigerated for at least 3 days before you use it. *Now for the purists out there, do feel free to start with fresh clams, and a clam knife, Its not too difficult to open the clams that way, just make sure you use a clam knife and not a kitchen knife. Come to say “Happy New Year 2012 to chef Dennis ” !!!…. 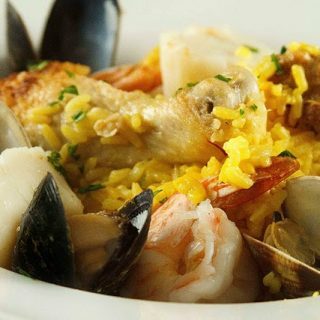 and hope you will be the popular chef on foodbuzz forever, because you always to be top 9 …I love seafood like this but I have spicy chili sauce with seafood too ,it’s easy just have garlic ,thai red chili ,lime juice,fish sauce and some sugar.. that’s it…. Chef Dennis…Happy New year !!! and congrats on Top 9. I enjoyed your romantic story in Paris with Lisa…a day to remember…those fireworks and your first new year eve’s kiss ! 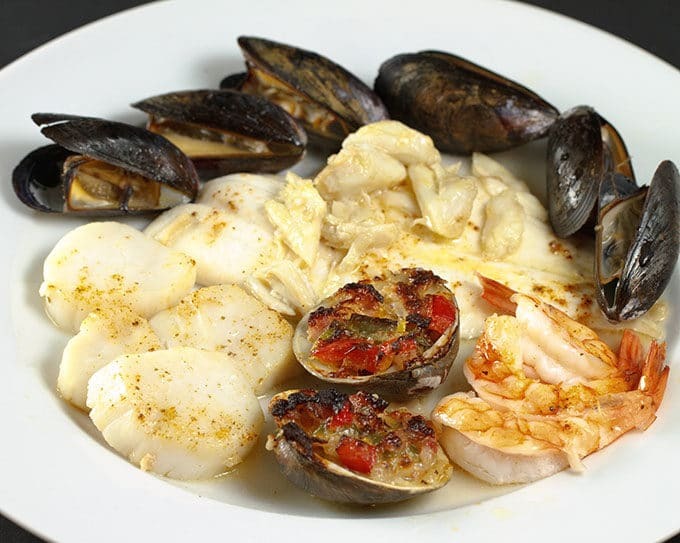 🙂 ….before I got carried away..your seafood combination looks good and you have managed to make me drool away 🙂 Have a great day Chef ! Wow this looks amazing! I def have to try clams casino. Looks fantastic! Especially with being served dinners like this! Have you been back?! Someday I’ll go back to Paris and take my husband with me. The next time I won’t squander the food opportunity on steak and french vanilla ice cream….I was two young the first few times to realize that the food that looked strange could actually be AMAZING. yes I’ve been 3 times to my favorite city, but its been too many years since our last trip, I keep telling my wife when I retire I want to spend a month in Paris, everytime I’m there I discover something new. Your story was beautiful! And the dinner…awesome!! I made a seafood dish also but not nearly as perfect looking as yours. And, Wegman’s really is so wonderful. I love just about everything about that store! Happy New Year! Happy New Year Sheri! The only thing I don’t like about Wegmans is how much I spend each trip, I always find too many good things! Congratulations on Top 9 and Happy New Year! 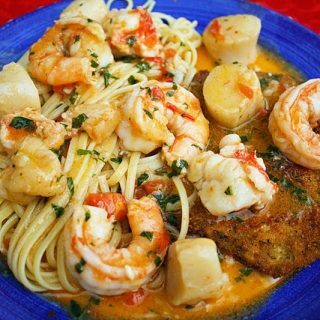 This looks amazing – I wish I wasn’t allergic to seafood! Next time you decide to do Disney – let me know! I maintain an annual pass and live a short drive away – I’d love to meet you & Mrs. Chef Dennis! thanks Ann! I would love to come back down, its been so long since weve done any traveling, we are really due! I will certainly let you know when we can schedule some Mickey time! What a wonderful memory! I would love to spend New Year Eve or really any day in Paris. I think it is the most perfect city in the world. 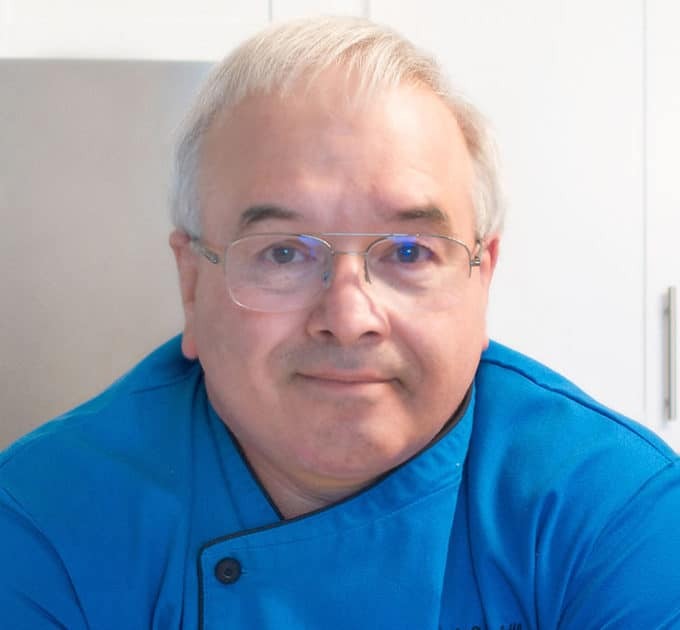 I loved your story, Chef Dennis! I’ve never been to Paris, but it’s on me and the Hubs list of places to go! This seafood platter looks wonderful! This looks absolutely amazing, such a great recipe! Happy New Year! Paris is always better than Disney. Well I’m assuming it is anyways, having never been to Paris. Clams are one of my very favorite foods, and your clams casino looks amazing. I’ve always seen and made it with bread crumbs. I never thought to do it without. Now if you had a recipe for Oysters Rockefeller my shellfish repertoire would be complete. I was taught a non traditional way of making oysters rockefeller that everyone has seemed to enjoy over the years. I simply make a light cream sauce and blend it with my seasoned sauteed spinach, topping the oyster with this combination and then after cooking, topping with a little holandaise sauce. Again not the traditional version but one that has gotten raves through the years! What a lovely memory you have to enjoy every year! This seafood platter makes my mouth simply water. I have saved this recipe to make for my husband. He’s the clam lover in the family. Have a wonderful new year! What an amazing memory of your first New Year’s together! This looks like a great NYE dinner at home. We had seafood here too! Seeing recipes and photos like this make me wish we were back living on the Jersey Shore, where fresh seafood (especially clams and scallops) were always in abundance. Living in northeast Texas has its advantages — if you love catfish, or the frozen scrod from Wal Mart, which I don’t. 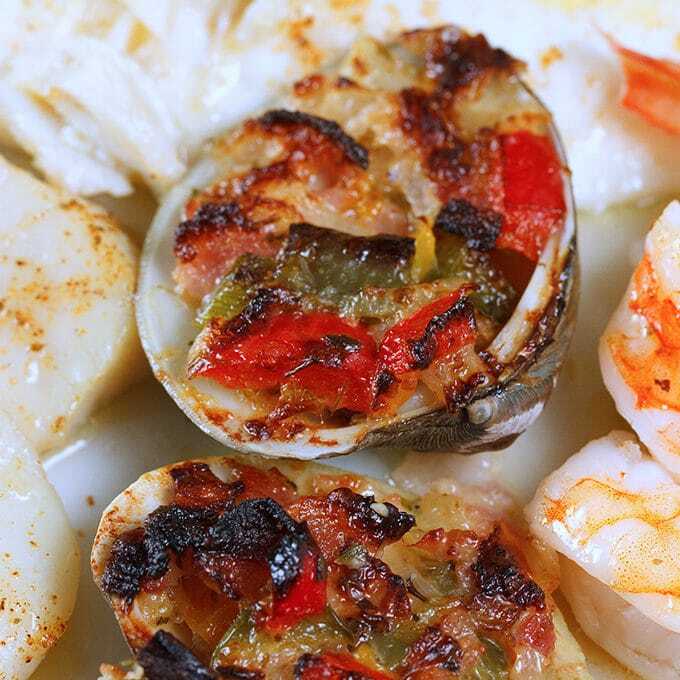 Ah, I long for clams casino … or even clams and garlic butter. 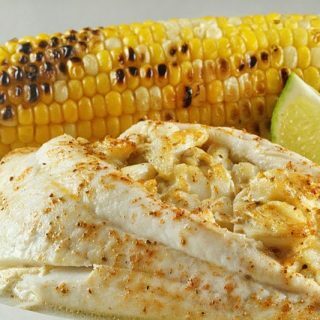 Coming from Texas, I do believe that it would be the one thing I would sorely missed If I ever moved back to the Lone Star State, the fresh seafood abounds in this area, and I have certainly grown use to having it available and affordable! Just stopped by to say Happy New Year! 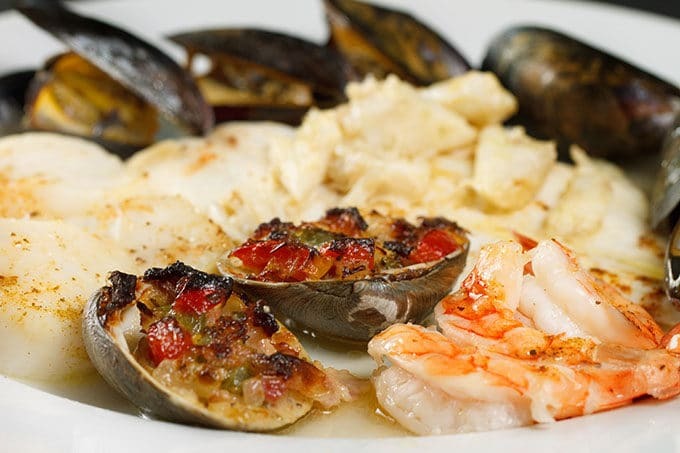 This seafood combination is something my family will love, especially the clams casino. So simple to make too. Thanks for the great recipe! I sometimes buy fresh clams and mussels from Costco. I thought they were usually fresh, but never checked the labels. I will now. Clams casino remain a favorite of mine. Been a while since I’ve had them and never have I made them. (For some reason, I have these cute little shells sitting up on the top shelf of my pantry. Maybe they want to get down!) Wonderful story, too! Aw, what sweet memories, Dennis! And such a sweet plate of deliciousness. 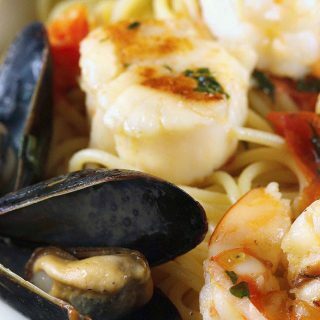 Your seafood dishes are always extraordinary…and this is no exception! Great Paris story. Your seafood dishes always look so good and I love clams casino but haven’t had them in many years. My folks lived in South Jersey in the 60’s and good fresh clams were a regular on the menu and Dad could make pretty good casinos. After seeing yours, I’m going in search of clams. This is just my kind of meal! Love it Dennis!